A collapsible modular tensile structure that allows you to set up a seating and a shelter wherever you want, a rolling cocoon in which you can rest in several different positions before rolling away again and again, a green parametric pavilion formed by a performance-specific components capable to build up a structure out of sawdust and fabric, a foldable fabric shelter able to unfold and possibly stand up as a minimum origami structure…. 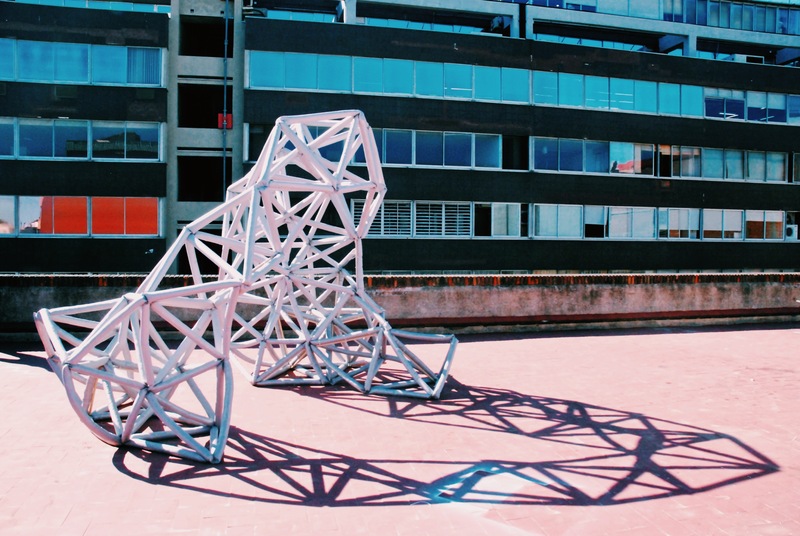 All of these experimentation have been shown on the 22nd of May at the final presentations of the seminar “lightweight structures 1:1″ at IAAC. 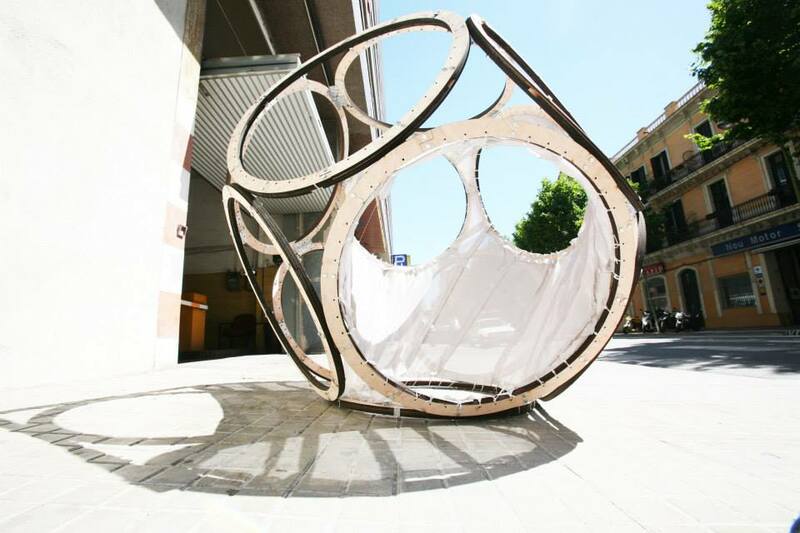 The aim of the seminar, led by Silvia Brandi and Rodrigo Rubio, with the collaboration of Pepe Ballestero (ETSAM Prototipolab) and Maria Kupstova, was to build four lightweight structures using structural fabric, within the format of an intensive workshop. For the development of the project the course counted on the partnership of Serge Ferrari company, which provided the high-performance fabric Stamisol FT 371-3048 and Stamisol FT 381-3128. The seminar has been developed in two sessions of three days each: in the first one four groups have been formed around four research topics: tensegrity structures, tensile structures, pure tension structures and fibrous structures. During the first phase each group developed a project proposal and went trough some material testing and prototyping. During the second phase the construction of the four pavilions has been carried out in IAAC. At the final presentation the students presented their projects to the jury board, formed by Ramon Sastre, tensile structure expert by ETSAV-UPC, Carmelo Zappulla, IAAC Faculty and principal of External Reference, Areti Markopoulou, MAA Director, together with the IAAC Alumni and Staff Mathilde Marengo, Dori Sadan and Moe Beagle. The idea was to have a portable and foldable structure that when folding in place become a cover for the pelgrims for the Santiago de Compostela Road. It could be folded into to a single component size for an easy transportation. long, round, and hollow like a tube: tubular flowers of deep crimson. The Geo-Sphere is based around the concept of tension. Whilst experimenting with the material, we tested the most efficient ways to contently keep it in tension. By creating a strong support system, we experimented with the positioning of the supports that would continuously stretch and hold the material. 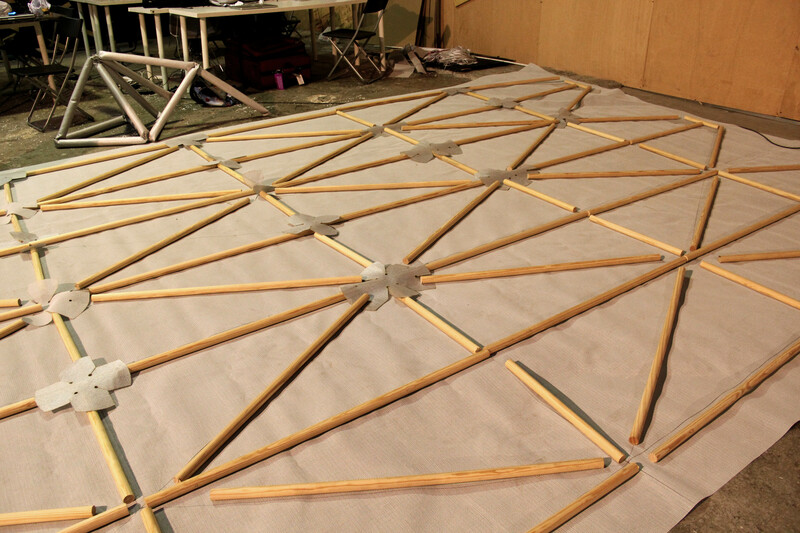 The purpose of the design was to allow the participants to crawl in and out of the dome through intersecting tunnels. The external sphere also allows the dome to constantly be moved and rolled around. Not only can the structure be placed in any setting, but the perspective from the tunnels is constantly altering. In order to ensure structural stability, the rings where divided, laser cut and slotted back together. Furthermore, each ring contains three layers of wood in order to support the weight of the material. Using Kangaroo, we divided the tunnels into stripes, which we later sowed back together. The material was then attached to the rings through layers of cable ties. By choosing your preferred passageway, the Geo-Sphere provides a new way to lounge. The Tensegrity Lego is made of collective tensegrity modules to achieve an overall counterbalanced and self standing structure. The structure of each module is achieved by a piece of fabric cut according to a specific geometry generated from Kangaroo, holding four poles along its four edges and eventually creating curvatures between each set of diagonal corners. The product of a balanced tension of compression results on modules that are structural and flexible at the same time. 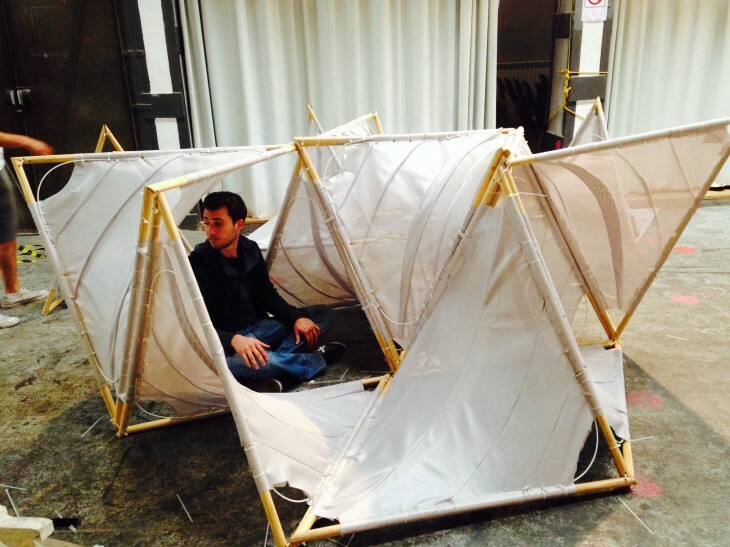 The combination of 15 modules creates a versatile structure that can be used according to the users’ imagination.